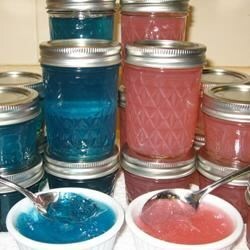 "Strawberry jelly made with powdered drink mix. An inexpensive and delicious spread. Try using different flavors of fruit and drink mix too." In a large saucepan over medium-high heat, mix together the strawberries, water, drink mix and pectin powder. Bring to a full rolling boil, then stir in sugar. Boil three minutes more. Transfer to sterile jars, leaving 1/2 inch space at the top. Wipe rims of jars with a clean dry cloth. Store in the refrigerator. Omitted the fruit and made jelly with artic apple koolaid brand drink mix...It created a very unusual flavor, but one that the kids loved. this was a very easy recipe i used pink lemonade drink mix. i made jellys for christmas gifts and this looked very nice in the jar.